If you are setting out to walk between the villages of the Cinque Terre, you'll probably arrive at one of them on the train. This guide assumes you're already in a village of the Cinque Terre (For instructions on how to get there, see our Map and Travel Essentials for the Cinque Terre). Many Tuscan establishments point out that the Cinque Terre is just a short way away. The five lands are not in Tuscany, but in Liguria, a region most tourists know better as "The Italian Riviera." Most guides will tell you not to try to drive to the Cinque Terre. Of course, you can drive, but parking tends to be troublesome, expensive or both. An alternative is to stay on one of the lesser-known towns on the ridge above the coastal cities. See Volastra: Cinque Terre You Can Drive To. In Italian, a trail is called a Sentiero. The trail that connects the five villages of the Cinque Terre is the famous Sentiero no. 2 or Sentiero Azzuro. It is 11 kilometers long. If the whole of it is open, it takes an estimated 5 hours to walk. There is a total elevation difference of 500 meters between the highest and lowest points of the trail. The section of the Sentiero no. 2 that connects Riomaggiore and Manarola has been called the Via dell'Amore since the thirties--I suppose because of lovers like the view. It's pretty level and takes only 20 minutes to walk. In recent times, tourism in the Cinque Terre has become more profitable than the wine grown on terraced vineyards above the town. Many vineyards are abandoned, which increases erosion during wet years and also increases the wild boar population, making grapes even more difficult to grow. When planning a vacation in the Cinque Terre, you are encouraged to view the National Park's guide to trail conditions. Ok, so here are a group of 50 somethings who've decided that the little lines on the map can't be a really bad thing. Usually, taking the blue trail, the walk between Manarola and Corniglia takes about 1 and a half hours. But once you pass Manarola's hostel, you see another side of the Cinque Terre. I mean, what could we have been thinking? There's a reason that the grape vines we see are so radically terraced, no? So it's steep. Luckily there are college kids on the trail. Some of them are whining. There's nothing like someone half your age whining about their exertion level to put some oxygen in your blood and a little pep in your step. So on we went, right up to the little village at the top, where the sign next to this church told us where to go to the village of Corniglia, or for trinkets. We chose the village, mostly because we were hungry. Ah, so after much walking, much of it up steep stairs carved out of the soil and lined with stepping stones, we get to descend into Corniglia. Here is a picture of the view as we descend. There is a benefit to our exertion. Corniglia lies below us, perched on the glittering sea. 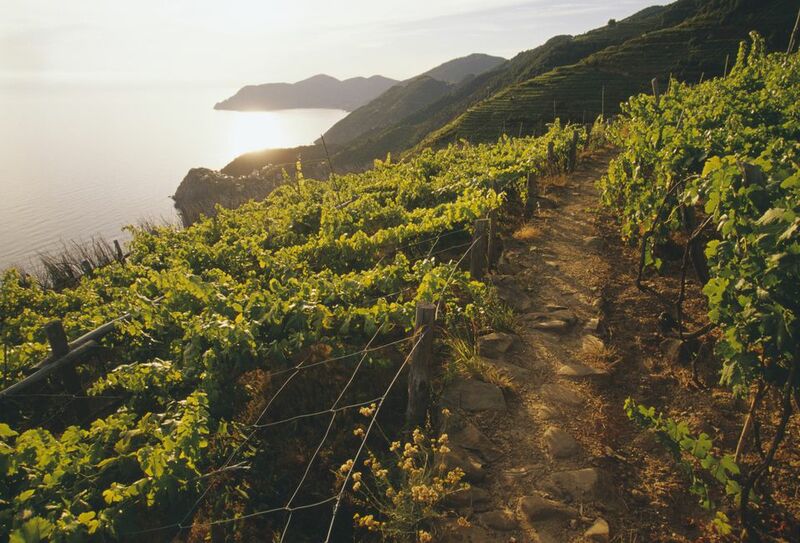 Walking the Cinque Terre Trails has always been about coming close to or even interacting with locals as they work in olive groves or vineyards. Our November excursion found folks out mending nets and placing them under olive trees like those shown here. In September or so you'll pass people carrying wine grapes from the harvest--usually on baskets carried on top of the head or slung onto a shoulder. We're on our third and final leg of this trip--Corniglia to Vernazza. We're loaded up with seafood and white wine from a little restaurant in Corniglia and on our way toward Vernazza. Here's the view as we look back one last time. It's November, so the sun is low at about 4 pm. You can see both Corniglia and Manarola in this picture. This part of the trial isn't so steep, but the trail is wedged between two steep terraces, as you'll see in the next picture, enough to make it almost scary sometimes. It's a Vertigo thing. This segment of trail runs beside vineyard terraces. The trail is quite narrow, and often there's a steep drop-off on the seaward side to the next terrace--maybe 12-15 feet. It's definitely a no passing zone. Here we go, down some steep stairs as we get ready for our descent into the Cinque Terre Village of Vernazza. These are even steeper than they look; you wouldn't want to be wearing high heels. Vernazza - We Made it to Our Final Destination in the Cinque Terre! We're not going on to Monterosso--there's not enough daylight left. It's taken us about 7 hours with our forced detour and longish lunch (including an appetizer). Not bad. And to be rewarded with this view isn't so bad either, Vernazza being the most picturesque of the Cinque Terre destinations. You can't miss the pay stations of the Cinque Terre, and the ticket price includes a map. You can also use a "blue card" which is a one, three, or seven-day card that covers unlimited train rides between Levanto and La Spezia (including all the Cinque Terre towns) as well as the use of the walking trails.